"Granulomatous" and "Granulomatous reactions" redirect here. For the Interstitial granulomatous drug reaction, see Interstitial granulomatous drug reaction. Not to be confused with Granulation tissue. Granuloma is an inflammation found in many diseases. It is a collection of immune cells known as histiocytes (macrophages). Granulomas form when the immune system attempts to wall off substances it perceives as foreign but is unable to eliminate. Such substances include infectious organisms including bacteria and fungi, as well as other materials such as keratin and suture fragments. In pathology, a granuloma is an organized collection of macrophages. In medical practice, doctors occasionally use the term "granuloma" loosely to mean "a small nodule". Since a small nodule can represent anything from a harmless nevus to a malignant tumor, this usage of the term is not very specific. Examples of the inaccurate use of the term granuloma are the lesions known as vocal cord granuloma, pyogenic granuloma and intubation granuloma, all of which are examples of granulation tissue, not granulomas. "Pulmonary hyalinizing granuloma" is a lesion characterized by keloid-like fibrosis in the lung, and is not granulomatous. Similarly, radiologists often use the term granuloma when they see a calcified nodule on X-ray or CT scan of the chest. They make this assumption since granulomas usually contain calcium, although the cells that form a granuloma are too tiny to be seen by a radiologist. The most accurate use of the term "granuloma" requires a pathologist to examine surgically removed and specially colored (stained) tissue under a microscope. Macrophages (specifically histiocytes) are the cells that define a granuloma. They often, but not invariably, fuse to form multinucleated giant cells (Langhans giant cell). 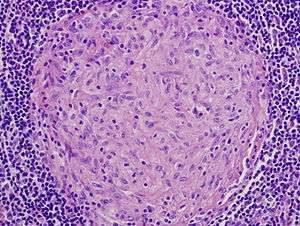 The macrophages in granulomas are often referred to as "epithelioid". This term refers to the vague resemblance of these macrophages to epithelial cells. Epithelioid macrophages differ from ordinary macrophages in that they have elongated nuclei that often resemble the sole of a slipper or shoe. They also have larger nuclei than ordinary macrophages and their cytoplasm is typically more pink when stained with eosin. These changes are thought to be a consequence of "activation" of the macrophage by the offending antigen. The other key term in the above definition is the word "organized" that refers to a tight, ball-like formation. The macrophages in these formations are typically so tightly clustered that the borders of individual cells are difficult to appreciate. Loosely dispersed macrophages are not considered to be granulomas. All granulomas, regardless of cause, may contain additional cells and matrix. These include lymphocytes, neutrophils, eosinophils, multinucleated giant cells, fibroblasts and collagen (fibrosis). The additional cells are sometimes a clue to the cause of the granuloma. For example, granulomas with numerous eosinophils may be a clue to coccidioidomycosis or allergic bronchopulmonary fungal disease, and granulomas with numerous neutrophils suggest blastomycosis, granulomatosis with polyangiitis, aspiration pneumonia or cat-scratch disease. In terms of the underlying cause, the difference between granulomas and other types of inflammation is that granulomas form in response to antigens that are resistant to "first-responder" inflammatory cells such as neutrophils and eosinophils. The antigen causing the formation of a granuloma is most often an infectious pathogen or a substance foreign to the body, but sometimes the offending antigen is unknown (as in sarcoidosis). Granulomas are seen in a wide variety of diseases, both infectious and non-infectious. Infections that are characterized by granulomas include tuberculosis, leprosy, histoplasmosis, cryptococcosis, coccidioidomycosis, blastomycosis and cat scratch disease. Examples of non-infectious granulomatous diseases are sarcoidosis, Crohn's disease, berylliosis, granulomatosis with polyangiitis, eosinophilic granulomatosis with polyangiitis, pulmonary rheumatoid nodules and aspiration of food and other particulate material into the lung. An important feature of granulomas is whether or not they contain necrosis. Necrosis refers to dead cells that, under the microscope, appear as a mass of formless debris with no nuclei present. A related term, "caseation" (literally: turning to cheese) refers to a form of necrosis that, to the unaided eye (i.e., without a microscope), appears cheese-like ("caseous"), and is typically (but not uniquely) a feature of the granulomas of tuberculosis. The identification of necrosis in granulomas is important because granulomas with necrosis tend to have infectious causes. There are several exceptions to this general rule, but it nevertheless remains useful in day-to-day diagnostic pathology. Granuloma without necrosis in a lymph node of a person with sarcoidosis. Granuloma with central necrosis in a lung of a person with tuberculosis. Note the Langhans-type giant cells (with many nuclei arranged in a horseshoe-like pattern at the edge of the cell) around the periphery of the granuloma. Langhans-type giant cells are seen in many types of granulomas, and are not specific for tuberculosis. The granulomas of tuberculosis tend to contain necrosis ("caseating tubercules"), but non-necrotizing granulomas may also be present. 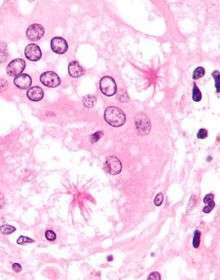 Multinucleated giant cells with nuclei arranged like a horseshoe (Langhans giant cell) and foreign body giant cells  are often present, but are not specific for tuberculosis. A definitive diagnosis of tuberculosis requires identification of the causative organism by microbiologic cultures. In leprosy, granulomas are found in the skin and tend to involve nerves. The appearance of the granulomas differs according to the precise type of leprosy. Some schistosome ova that are laid in intestinal and urinary venules backwash into the liver via the portal vein causing granuloma formation in the liver. Granulomas are seen in most forms of histoplasmosis (acute histoplasmosis, histoplasmoma, chronic histoplasmosis). Histoplasma organisms can sometimes be demonstrated within the granulomas by biopsy or microbiological cultures. When Cryptococcus infection occurs in persons whose immune systems are intact, granulomatous inflammation is typically encountered. The granulomas can be necrotizing or non-necrotizing. Using a microscope and appropriate stains, organisms can be seen within the granulomas. Cat-scratch disease is an infection caused by the bacterial organism Bartonella henselae, typically acquired by a scratch from a kitten infected with the organism. The granulomas in this disease are found in the lymph nodes draining the site of the scratch. They are characteristically "suppurative", i.e., pus forming, containing large numbers of neutrophils. Organisms are usually difficult to find within the granulomas using methods routinely used in pathology laboratories. Rheumatic fever is a systemic disease affecting the peri-arteriolar connective tissue and can occur after an untreated Group A Beta-hemolytic streptococcal pharyngeal infection. It is believed to be caused by antibody cross-reactivity. Two asteroid bodies in sarcoidosis. H&E stain. Sarcoidosis is a disease of unknown cause characterized by non-necrotizing ("non-caseating") granulomas in multiple organs and body sites, most commonly the lungs and lymph nodes within the chest cavity. Other common sites of involvement include the liver, spleen, skin and eyes. The granulomas of sarcoidosis are similar to the granulomas of tuberculosis and other infectious granulomatous diseases. However, in most cases of sarcoidosis, the granulomas do not contain necrosis and are surrounded by concentric scar tissue (fibrosis). 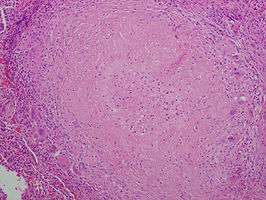 Sarcoid granulomas often contain star-shaped structures termed asteroid bodies or lamellar structures termed Schaumann bodies. However, these structures are not specific for sarcoidosis. Sarcoid granulomas can resolve spontaneously without complications or heal with residual scarring. In the lungs, this scarring can cause a condition known as pulmonary fibrosis that impairs breathing. In the heart, it can lead to rhythm disturbances, heart failure, and even death. Crohn's disease is an inflammatory condition of uncertain cause characterized by severe inflammation in the wall of the intestines and other parts of the abdomen. Within the inflammation in the gut wall, granulomas are often found and are a clue to the diagnosis. Listeria monocytogenes infection in infants can cause potentially fatal disseminated granulomas, called granulomatosis infantiseptica, following in utero infection. Pneumocystis infection in the lungs is usually not associated with granulomas, but rare cases are well documented to cause granulomatous inflammation. The diagnosis is established by finding Pneumocystis yeasts within the granulomas on lung biopsies. Aspiration pneumonia is typically caused by aspiration of bacteria from the oral cavity into the lungs, and does not result in the formation of granulomas. However, granulomas may form when food particles or other particulate substances like pill fragments are aspirated into the lungs. Patients typically aspirate food because they have esophageal, gastric or neurologic problems. Intake of drugs that depress neurologic function may also lead to aspiration. The resultant granulomas are typically found around the airways (bronchioles) and are often accompanied by foreign-body-type multinucleated giant cells, acute inflammation or organizing pneumonia. The finding of food particles in lung biopsies is diagnostic. Necrotizing granulomas can develop in patients with rheumatoid arthritis, typically manifesting as bumps in the soft tissues around the joints (so-called rheumatoid nodules) or in the lungs. Granuloma annulare is a skin disease of unknown cause in which granulomas are found in the dermis of the skin. However, it is not a true granuloma. Typically there is a central zone of necrobiotic generation of collagen with surrounding inflammation and mucin deposition on pathology. A foreign-body granuloma occurs when a foreign body (such as a wood splinter, piece of metal, glass etc.) penetrates the body's soft tissue followed by acute inflammation and formation of a granuloma. In some cases the foreign body can be found and removed even years after the precipitating event. Certain inflammatory diseases are characterised by a combination of granulomatous inflammation and vasculitis (inflammation of the blood vessels). Both the granulomas as well as the vasculitis tend to occur in association with necrosis. Classic examples of such diseases include granulomatosis with polyangiitis (GPA; previously referred to by the eponym Wegener's granulomatosis) and eosinophilic granulomatosis with polyangiitis (EGPA; formerly known as Churg-Strauss syndrome). The term is from granule + -oma. The plural is granulomas or granulomata. The adjective granulomatous means characterized by granulomas. Contact granuloma, i.e. "throat granuloma". 1 2 3 4 5 6 Mukhopadhyay S, Farver CF, Vaszar LT, Dempsey OJ, Popper HH, Mani H, Capelozzi VL, Fukuoka J, Kerr KM, Zeren EH, Iyer VK, Tanaka T, Narde I, Nomikos A, Gumurdulu D, Arava S, Zander DS, Tazelaar HD (Jan 2012). "Causes of pulmonary granulomas: a retrospective study of 500 cases from seven countries". J Clin Pathol. 65 (1): 51–57. doi:10.1136/jclinpath-2011-200336. PMID 22011444. 1 2 Woodard BH, Rosenberg SI, Farnham R, Adams DO (1982). "Incidence and nature of primary granulomatous inflammation in surgically removed material". American Journal of Surgical Pathology. 6 (2): 119–129. doi:10.1097/00000478-198203000-00004. PMID 7102892. ↑ Hunter DC, Logie JR (1988). "Suture granuloma". British Journal of Surgery. 75 (11): 1149–1150. doi:10.1002/bjs.1800751140. PMID 3208057. ↑ Chen KT, Kostich ND, Rosai J (1978). "Peritoneal foreign body granulomas to keratin in uterine adenocanthoma". Archives of Pathology and Laboratory Medicine. 102 (4): 174–177. PMID 580709. ↑ Adams DO (1976). "The granulomatous inflammatory response. A review". American Journal of Pathology. 84 (1): 164–191. PMC 2032357 . PMID 937513. ↑ Travers P, Walport M (2008). Janeway's Immunobiology. Garland Science. p. 372. 1 2 3 4 Mukhopadhyay S, Gal AA (2010). "Granulomatous lung disease: an approach to the differential diagnosis". Archives of Pathology and Laboratory Medicine. 134 (5): 669–690. doi:10.1043/1543-2165-134.5.667. PMID 20441499. ↑ Iannuzzi M, Rybicki BA, Teirstein AS (2007). "Sarcoidosis". New England Journal of Medicine. 357 (21): 2153–2165. doi:10.1056/NEJMra071714. PMID 18032765. ↑ Cohen, Elizabeth (June 11, 2009). "Teen diagnoses her own disease in science class". CNN Health. Cable News Network. ↑ Hartel PH, Shilo K, Klassen-Fischer M, et al. (2010). "Granulomatous reaction to Pneumocystis jirovecii. clinicopathologic review of 20 cases". American Journal of Surgical Pathology. 34 (5): 730–734. doi:10.1097/PAS.0b013e3181d9f16a. PMID 20414100. ↑ Mukhopadhyay S, Katzenstein AL (2007). "Pulmonary disease due to aspiration of food and other particulate matter: a clinicopathologic study of 59 cases diagnosed on biopsy or resection specimens". American Journal of Surgical Pathology. 31 (5): 752–759. doi:10.1097/01.pas.0000213418.08009.f9. PMID 17460460. ↑ "Foreign Body Granuloma". Journal of Maxillofacial and Oral Surgery. March 2011. ↑ El Bouchti, I.; Ait Essi, F.; Abkari, I.; Latifi, M.; El Hassani, S. (2012). "Foreign Body Granuloma: A Diagnosis Not to Forget". Orthopedics. Hindawi Publishing Corporation. 2012. doi:10.1155/2012/439836.